REACH FOR THE STARS was recorded at Gatorbone Studios by Lon Williamson, an incredible sound engineer, who is also talented in a number of other areas as well. As a luthier Lon builds mandolins. He is also a gardener: his little fenced in plot of raised beds produces beans, kale, peas, tomatoes and some of the best mustard greens on the planet. Add to that a long row of carefully tended blueberry bushes, from which one can munch during breaks in the studio, and you get a picture of paradise in the sandhills of Florida. Lon and Elisabeth (Lis), his wife of almost 40 years, live in a cracker style home, similar to that of Marjorie Kinnan Rawling’s in Cross Creek. This wooden structure affords Lon plenty of opportunity to ply his carpentry skills, as do the raccoons on the property who make sure that he doesn’t get bored by repeatedly tearing off bits of roofing and breaking into places they shouldn’t be. Devoted grandparents, Lon and Lis are part of an extended and loving family with roots that extend deep into the Florida soil. Together they form a dream team. 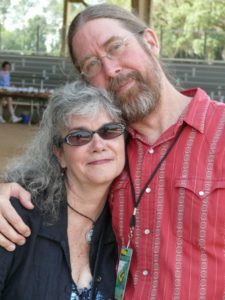 Since Lis’ teens the two have partnered musically in a multitude of musical configurations. They even had a stint as restauranteurs, opening and running a popular restaurant in St. Augustine back in the eighties called The Zanzibar Cafe. Eventually they relocated to Lis’s mother’s home on Gatorbone Lake in Keystone. 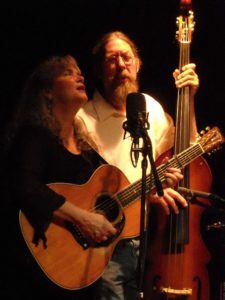 Lon plays bass and Lis plays guitar, tenor guitar and banjo. Together they are a delightful singing duo and the core of some of Florida’s hottest musical ensembles: The Gatorbone Trio, The Gatorbone Band, The Driftwoods, The Tucker-Williamson Trio, The Lis and Lon Duo and The Starlight Trio with Rick Kuncicky. Exemplary artists and amiable folk, they attract a large community of like-minded and musically talented souls. Seeing the opportunity to highlight the acoustic music coming from artists in their beloved state they founded Gatorbone Studios and the Gatorbone Records Label. Among the many well loved artists recorded at Gatorbone Studios are guitarist extraordinaire Jack Williams and vocal power duo Flagship Romance. Behind the board at Gatorbone Studios, Lon is a quiet, patient recording engineer with an ear for detail, an impressive musical sensibility and an organized and thoughtful approach. A good listener, Lon strives to help each artist achieve their musical vision within their budget, and he does so with no noticeable involvement of ego, something quite impressive considering how much time and energy he invests in the projects of others. The focus of Gatorbone Studios is original acoustic music, and to that end Lon has built marvelous working relationships with a number of incredible musicians that have lent their talents to projects coming out of the studio. Among those musicians are his fellow band members Gabe Valla (acoustic guitar, mandolin and mandocello), Jason Thomas (fiddle and mandolin), James Tuck Tucker (dobro), and of course Lis (banjo, guitar, high strung guitar, harmony vocals). When it comes time for mixing and mastering, Lon joins forces with Pete Winter at Winterstone Productions in Tallahassee, Florida, Lon’s hometown. 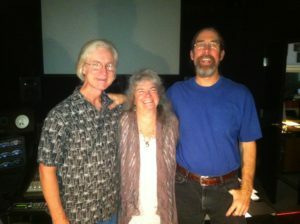 Pete and Lon both have great ears, stellar musical sensibility, and shared a love for acoustic music. Nothing gets by them as they strive for the best possible mix. The end result is always impressive, and the process is always enjoyable. Occasionally, if you listen closely, you will discover amongst the people around you, a quiet, self-effacing individual whose achievements are quite remarkable and wonderful. Lon Williamson is one of those people. It has been a honor and privilege to work with him and an honor to call him friend. I count myself as one of the lucky ones that call him friend. Thanks for reading. Hope you enjoyed it. Stay tuned, more spotlights will be coming up!